My personal tastes are primitive with some colonial and "country" thrown in. When it comes to quilts, my go to fabrics are Civil War, reproduction and country. 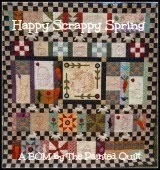 I love scrappy quilts and the homey feeling they exude. When it comes to decorating, my tastes are also very eclectic, or scrappy. 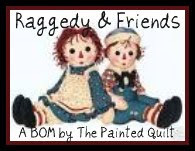 I am definitely not a "matchy-matchy" or "froo froo" kinda gal. 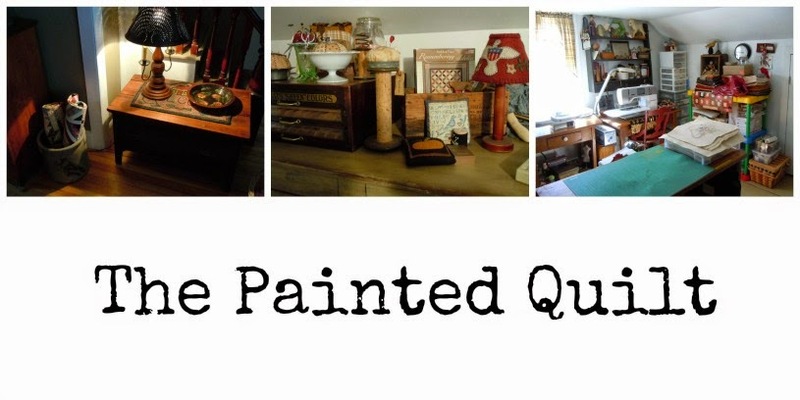 I like to mix different styles, eras, antiques, reproductions and new and old. If you like it, they'll all blend together. Really! So you're probably asking yourself, "Where the heck is she going with this? Like, get to the point already!" Remember I received two packages the other day and held off telling or showing you what was inside? Just wait till you see what I got! Sooooooo out of the box for me!!! 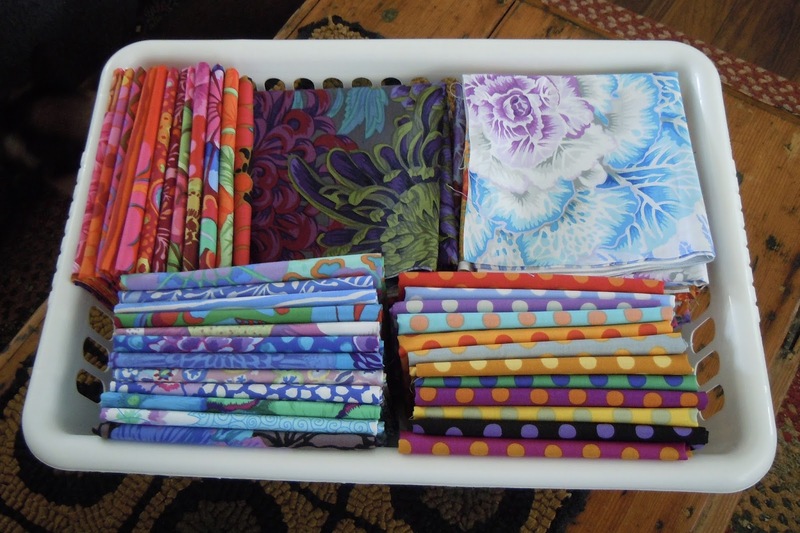 A bucket full of Kaffe Fassett fabrics!!! 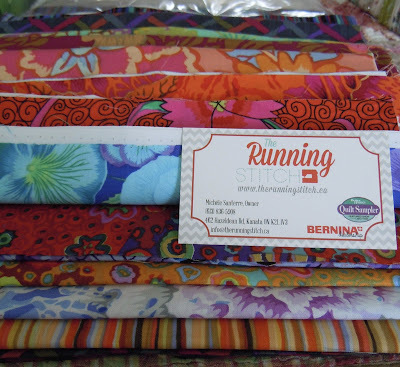 Now if there's anything further from CW or reproduction fabrics than Kaffe's, I'd like to see them! I needed and wanted to try something new and although they are soooooo not my style, I've always been very attracted to them. Perhaps it's my artist background with the giant splashes of color and design elements. 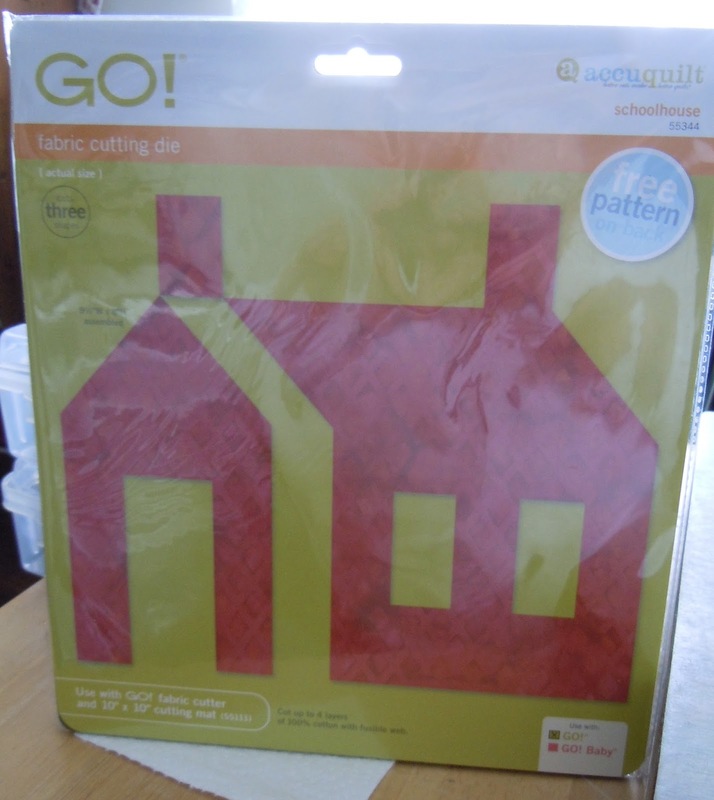 I'm not 100% certain what I'm going to make with them but I did purchase this school house dye for my GO cutter last week and I'm thinking of making a Kaffe-scrappy school house quilt. Wouldn't that look sooooooo cool? 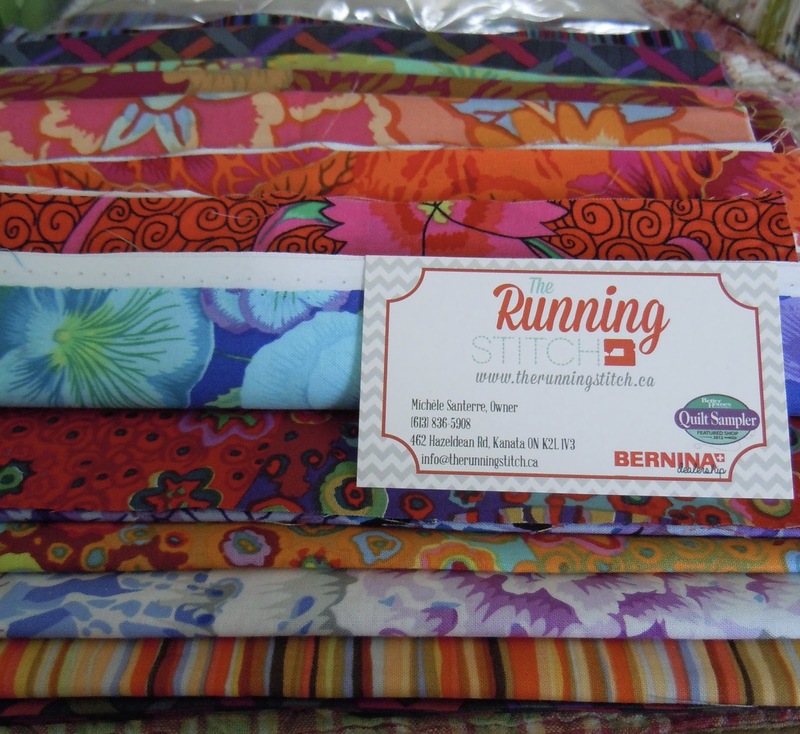 One thing for sure, they certainly brighten up my sewing studio! I've had a couple of scary blips on the health radar over the past couple of weeks which is the reason why I haven't been posting much. On Tuesday after visiting with my oncologist, I was given some very encouraging news and as you can well imagine, my spirits are soaring. I feel so light-hearted and the stress is gone. Thank you God for answering our prayers! So today was like Christmas, maybe even better. Mr. Painted Quilt and I went out for a leisurely home-cooked breakfast, picked up a "few" groceries (if that is even possible), stopped into Michael's to pick up some supplies to make a mini design wall and lastly, popped into the post office to check for mail. And look what was waiting for me...not one but two packages of guess what??? We had some rain, freezing rain and some snow overnight so it looks like I'll be stuck inside until I'm absolutely certain that there's no ice lurking underfoot. The sun is shining and there's not a cloud in the sky so it looks like it just might be a perfect day to stay indoors to stitch and sew. 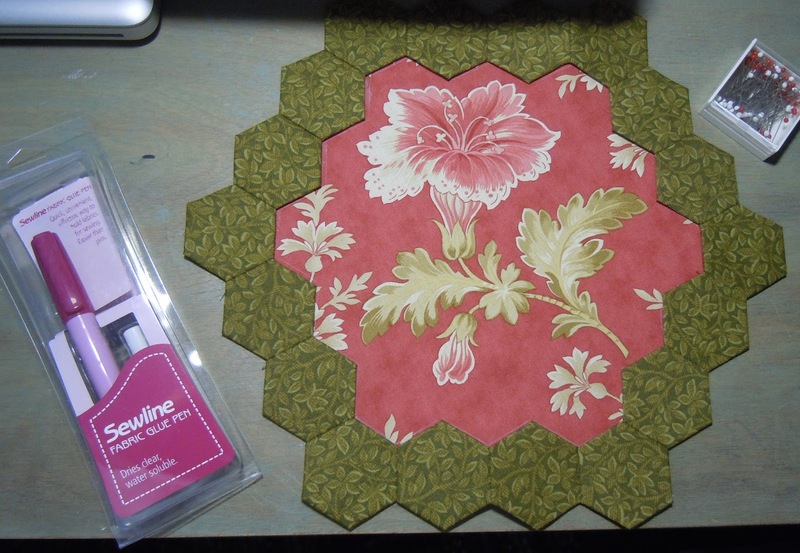 Yesterday, I started putting together the center medallion to my Brinton Hall quilt. I did manage to get the hexie rings sewn together before we sold our house and I quickly put it away when I realized that we had so much to do with respect to the move and sewing just wasn't on the short list. I've decided to make my version using all Civil War and reproduction fabrics and I'm loving the look. My goal for today is to get all seven large hexie blocks appliqued and then it'll be on to the next step of connecting them all. Lots of work but I love handwork! The instructions and photos for the Brinton Hall quilt are spread between two issues of Quiltmania magazine, #'s 107 and 108. It's quite an ambitious project but I'm anxious to get back to it. Some glue basting is involved which brings me to my next point. Have you ever used the "Sewline Fabric Glue Pen"? 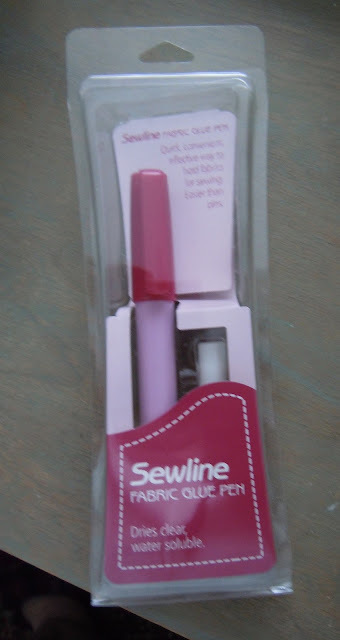 If you haven't then I would suggest that you get one to add to your bag of sewing stuff. I've tried every brand of fabric glue and this, IMHO, is by F-A-R the best one yet! The glue is soft and pliable, spreads like butter and STAYS soft. Oh, and Frankie is never too far away, always willing to add his two cents. 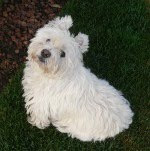 Note to Wilma : Thanks for taking the time to leave a comment on my last blog post. I'm sorry but I was unable to answer your question because you came up as a "no-reply" blogger. This means that when you set up your profile, you didn't include your email address. I purchased the cherry fabrics that I used for my ditty bags at JoAnn's about seven or eight years ago. It is 100% cotton and not vinyl. I doubt if they have the exact fabric now but you never know. Good luck in your search.